I previously posted a recipe for Coconut Powder where I used Chana Dal (Pacchi Senagapappu) along with dry coconut. Today I am posting a different and easiest recipe for delicious Kobbari Podi with fresh coconut. Add all the ingredients to a blender jar and grind until smooth. That’s all. Great tasting coconut powder is ready to be savored. 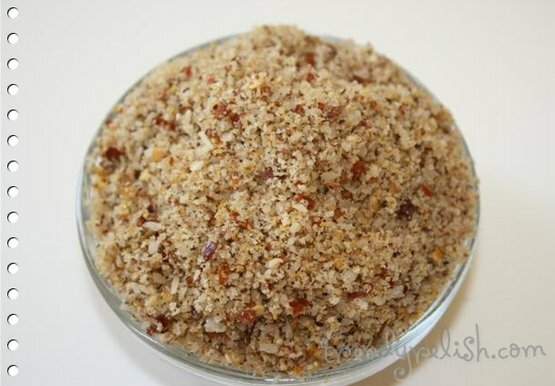 This podi goes well with steaming hot rice as well as idlis. I love these kinds of spice powders. Adds amazing flavor to rice! Wonderful podi with delectable flavors !! Flavorful looking podi. Nice and simple recipe with little ingredients. YUM!!!! This looks so good....feel like scooping up a spoonful and eating with hot rice topped with ghee.